Asience Smooth type treatment works by increasing the core density of each strand of hair to bring out a deep gloss for radiant hair. Hair treatment made especially for the needs of thick hair and hair that suffers from coloring, perming, styling, braiding and drying. Ginseng extract helps the hair retain moisture, and restores suppleness within the hair follicle. Daily TLC for your hair, Shampoo (4198) and Conditioner (4199) also available. From Japan comes KAO's Asience hair formula made especially for the needs of Asian hair, and for all other thick hair with dense follicles. We like this product because the active ingredients are concentrated in beneficial amounts, helping to repair the inner fibers of damaged and brittle hair. Formulated with oriental hair care ingredients for hydration and softness for easy to manage hair. 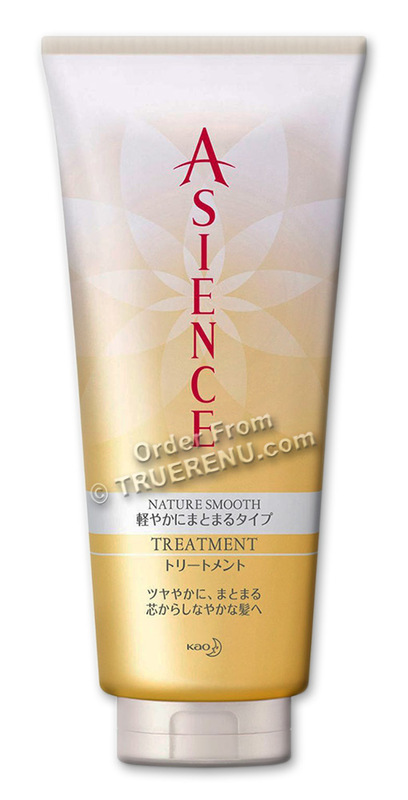 Blended with lotus extract, ginseng extract, camellia oil, aloe extract and pearl protein and malic acid. These increases the density of the hair, restoring suppleness to the inner fibers. The active ingredients deeply penetrate the fibers of the hair to repair, nourish and protect it from the inside out. Squeeze treatment into palm and work into wet hair thoroughly, massage into scalp and through hair ends. Wait a minute or two and rinse with warm (not hot) water. Best if used after shampooing and conditioning with KAO Asience Nature Smooth Shampoo (4056) and Conditioner (4057). For men, women and children. Can be used every day and is safe for all hair types, but especially good for thick, coarse, or brittle hair. Ingredients: water, stearyl alcohol, dimethicone, stearoxypropyldimethylamine, DPG, lactic acid, nelumbo nucifera (sacred lotus) flower extract, panax ginseng root extract, camellia japonica seed oil, hydrolyzed conchiolin protein, alpinia speciosa (shell ginger) leaf extract, aloe barbadensis leaf extract, malic acid, lanonin acid, jojoba esters, isopropyl palmitate, hydrogenated castor oil, hydroxystearate dipentaerythrityl hexahdroxystearate/ hexastearate/ hexarosinate, amodimethicone, hydroxyethylcellulose, PEG-45M, ceteareth-7, ceteareth-25, butylene glycol (BG), benzyl alcohol, alcohol, caramel, fragrance.